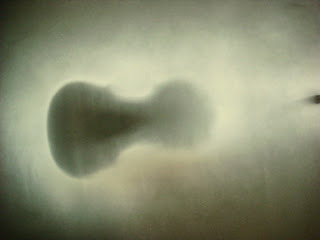 (click to enlarge) 2008 Painted Violin titled play. I love music. So, every year when the South Carolina Philharmonic invites artists to participate in the Painted Violin project, my friend Janette Grassi and I are eager to do so. This year, however, was different. It was a juried competition so there were no guarantees of being included. We had to create a concept and proposal and submit it. So, you can imagine our joy when we received confirmation that we were included. Artists are invited to participate in many benefits but this is by far our favorite. We want to support the SC Philharmonic and the SC Philharmonic appreciates and values artists. Event chairperson Lani Stringer is the most creative, organized person and does an incredible job of highlighting the artists and their work. Last year she designed a very artful, full color catalog for the event and this year she is creating a book which will be auctioned along with the violins. 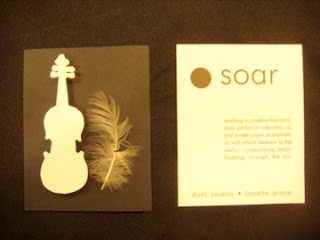 She also designs and produces a poster of each piece which is yet another sales opportunity for the Philharmonic. In addition, she organizes a reception for the event and this year it will be held in conjunction with Artista Vista, when a large crowd of art supporters are present. The South Carolina Philharmonic is lucky to have such a talented, dedicated volunteer and we are excited to be included in the 2009 Painted Violin benefit! 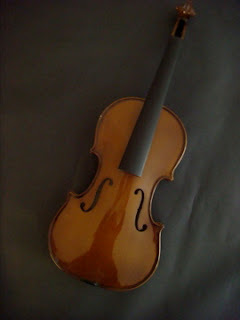 (click to enlarge) 2009 Painted Violin proposal. (click to enlarge) Violin provided. (click to enlarge) A work in progress. 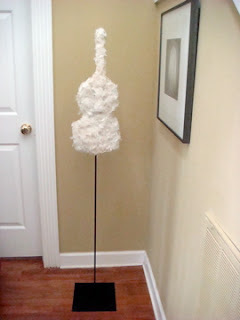 (click to enlarge) Finished violin on metal base titled soar.